Rose-Kim Knits: Sigh. Sigh. Sigh. Okay. So the sweater I am knitting is Katarina by Cocoknits. We are having a shop knitalong that starts next month and I am making the shop sample. I am making the smallest size. Which is now a bit smaller because I grabbed a US7 instead of an 8 on my way out the door to Vancouver. It's not a total disaster. I won't rip it out and reknit the whole thing but I do have to explain to customers (over and over) that my version is not as large or as drapey as it should be. Sigh. Audrey has been done and off the needles for days. I just can't work up the energy to sew on the buttons. Sign again. Next up is finally figuring out if this mess can become a sweater. I'm not sure. Sigh once more. Well, that's not so bad about the first and second sighs. What is sigh #3 going to be????? Ooh...Katarina is beautiful! I hadn't seen that one. 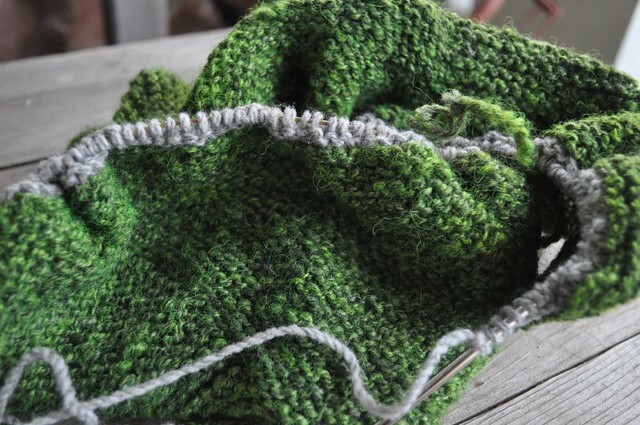 What yarn are you using for it? I am doing a KAL with Village Yarn (EZ's Hand-To-Hand) starting this month, dare I also do Katarina too??? Talk me out of it. Now.